I just wanted to share this beautiful video of the Amish that I happened to find completely by accident, but I can’t seem to stop watching! When I can’t relax, or get inspired to do my artwork, I watch this and I want to get right back to painting again. It’s a nice relaxing 3 minutes. Please watch and let me know what you think! Hello and I know it’s been awhile. I am so sorry. I just came back from a week out to North Carolina and I have been so out of sync…but I am getting there! I have been starting to paint some farm, fruit signs that almost look like the vegetable ones I am selling currently on Etsy. The vegetable signs seem to be so popular, so I figured I would also try several paintings of fruit. I will show you when they are finished and ready to put up on Etsy. 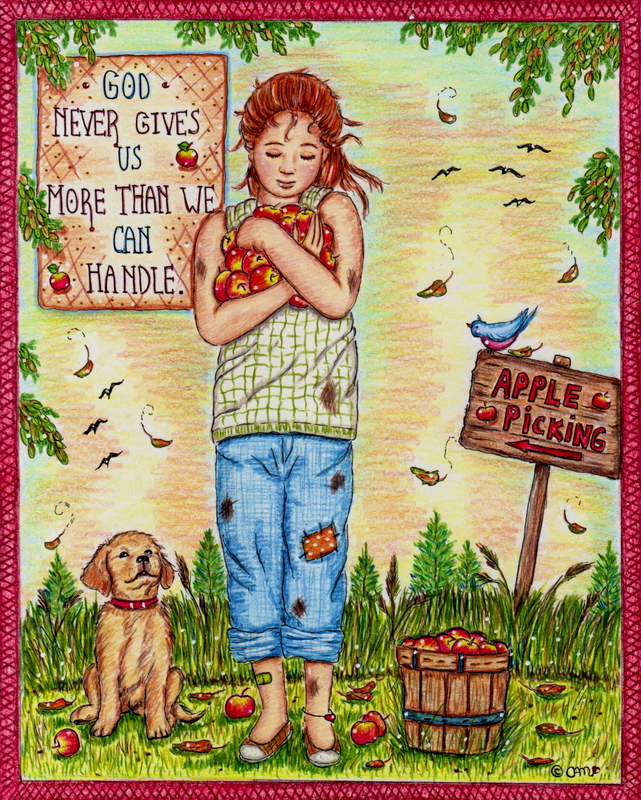 But in the meantime, as many of you know, I have a passion for doing pictures and paintings with amish themes. 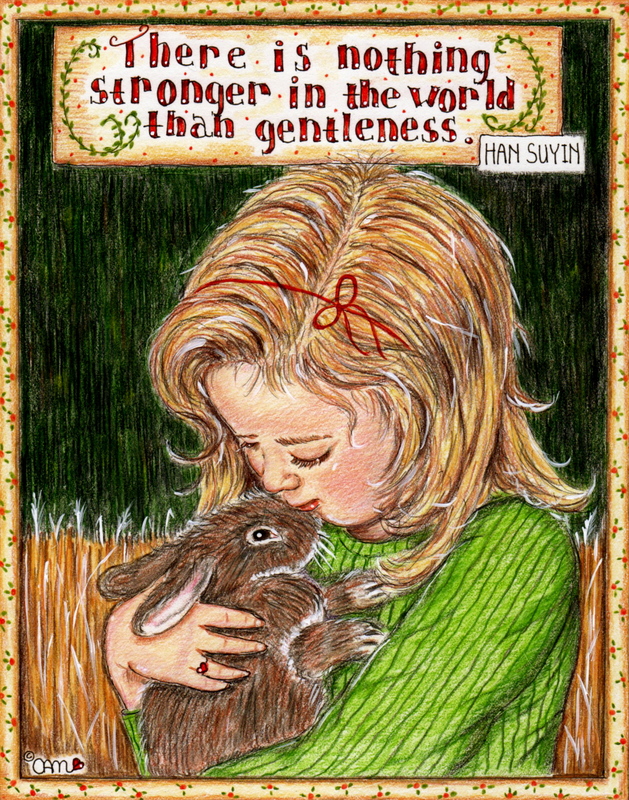 I am currently working on a watercolor painting of an amish girl walking with a calf through grassy field. It’s just a sketch right now, but I will show you what I have soon… But while this is in the works, I figured I’d show you these photos I create and sell on Etsy. 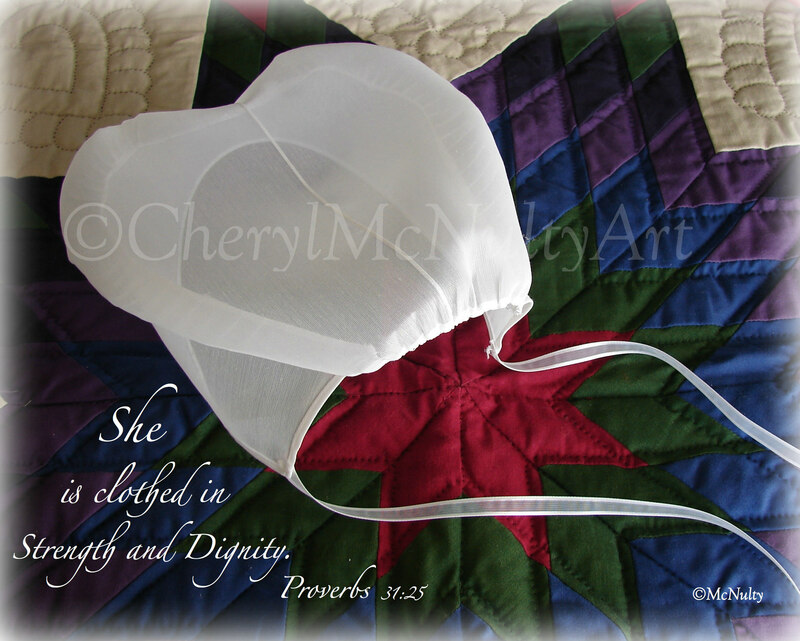 They are prayer caps and straw hats used in photos with quilts and I add inspirational quotes when I think they would add to the photo.Some I haven’t put up on Etsy yet, but will be soon…Enjoy! Hi all! I am so sorry for not keeping up on this blog lately. I am now getting ready for my daughter’s graduation from college and I have been busily painting rooms and fixing things around the house like crazy. It actually feels good to see change,I must say. And who can beat the look and smell of fresh paint! Anyway, I just thought I would share with you this painting which has been sitting unfinished like this awhile now. It’s another Amish Girl and she is supposed to be watching a baby chick on her lap. 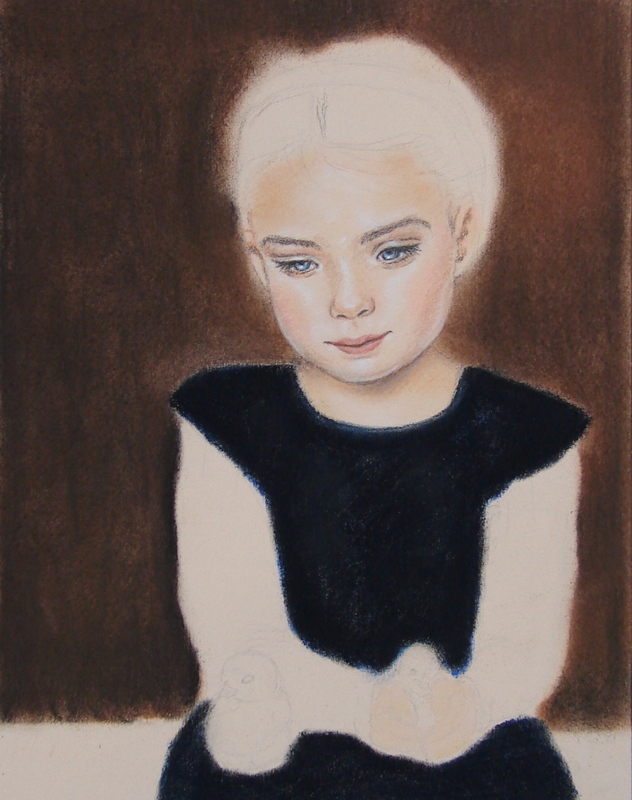 I really love the face on this little girl and I can’t wait to finish her, but she has to wait just a little bit. Every time I go into my room she is staring at me and I want so badly to just sit there and get down to business. I will…I will ! I will post again when I am finished with her. Here is also another painting I finished. I have been doing random watercolors just to keep up with my artwork and to put something new in my Etsy shop. These watercolor paintings are less time consuming than the pastels, so I try to fit a few in before I start my fixing and painting of the house. 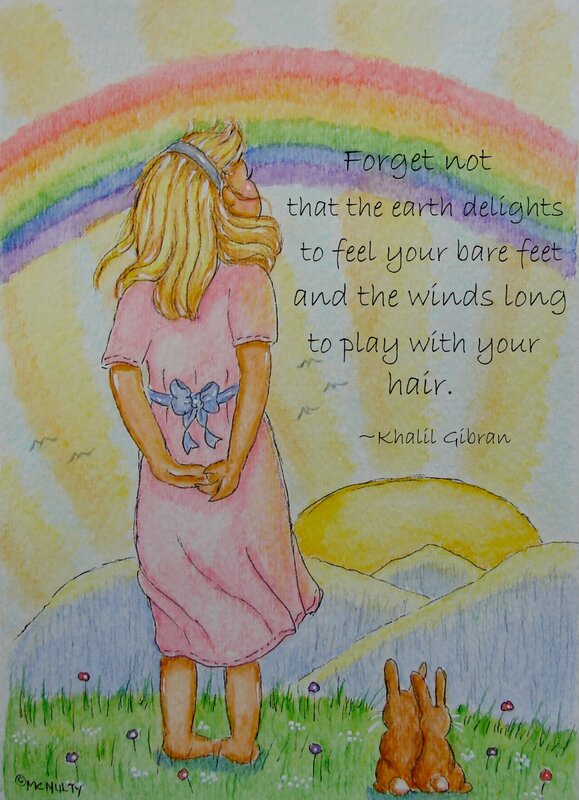 This one is in watercolors and it’s a little girl looking out over the mountains under a beautiful rainbow. Inspired by the very thing I love to do, observe nature! I hope you like them. Be back soon!